Well no one has posted in the deck section for a while, so I thought I would bring up one of my old decks that did amazing. As many of you already know, I love control in my deck, and worms is the deck to be controlling in, so here it goes. So, to start off, I run the basic form, with trags and what not. I may make it to a choas build. Well maybe just black luster soldier. But the property of the deck doesn't really base around it much. Also, the queen card for reptiles (Which I forgot the full name of o.O) Isn't really one of my styles since it's really easy to get rid of, and caqn be a dead draw too much early in the game. i main a worm control deck too and i must say mine looks very different. btw if its a control deck, then wheres bottomless? 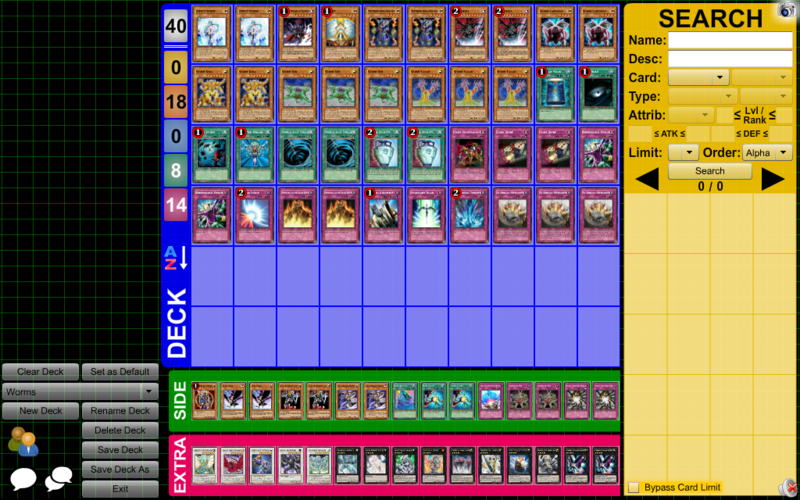 cuz if im correct bth is like one of the most control cards there are ._. You have Triforce in extra deck but TRiforce needs a genex tuner and u have non .___.